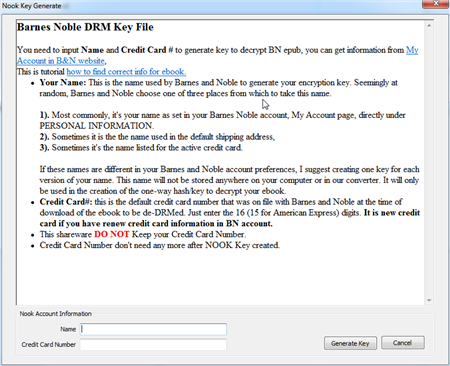 How to covnert NOOK DRM ebook to PDF format? A. When you purchase ebook from bn.com, NOOK ebook file has DRM protection which NOT support by other ereader, that is ebook DRM limitation, you can’t read in any device, this is guide to convert drm NOOK ebook to pdf format. 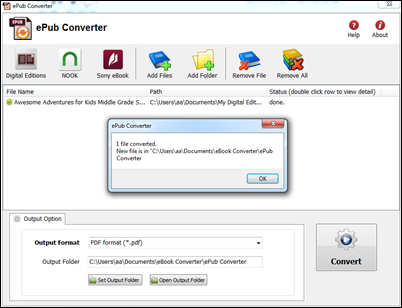 ePub Converter is tools to convert Barnes & Noble NOOK DRM ebook to PDF/HTML/Word/Text format, it support both DRM and DRM free NOOK ebook, user can read purchased ebook in any device without limitation after ebook format conversion, it is eay use, support drag and drop, import NOOK ebooks from NOOK for PC automatically, convert DRM NOOK file to other format with 1-click. 2. To convert B&N NOOK ePub files, you’ll need to install ePub Converter, click the Download link. 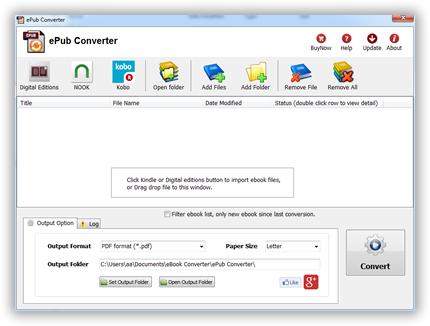 once you’ve download ePub Converter, install it as normal. you click “Open output folder” to find new drm free ebook file, now you can open your pdf file in any eReader program, share it to your friend.